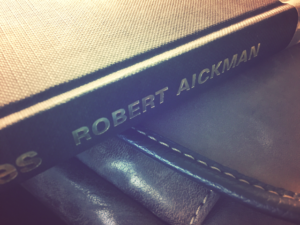 I’ve compiled a grid of all of Robert Aickman’s works, published both living and posthumously, and in which volumes they may be found. Based on the above survey, I’ve ordered for myself good-condition used copies of The Unsettled Dust, Cold Hand in Mine and The Wine Dark Sea for about $50 total. These seem to represent a strong sampling of his work, with little overlap, and their print runs are recent enough to be available. Most of Aickman’s older collections have long since fallen out of print, and been culled from libraries. The Boston Public Library’s Copley Square branch offers only a single copy of Night Voices for circulation, available at the delivery desk. His stories have been anthologized in numerous collections, mostly out of print. CBC radio did a respectable half-hour dramatisation of “Ringing the Changes,” which is available on YouTube. Ideal would of course be to obtain the two volume Collected Strange Stories, but with only a 500-copy limited run in 1999, one would need to be somewhat more obsessive and far wealthier than me–to the tune of $500 plus–to secure one.